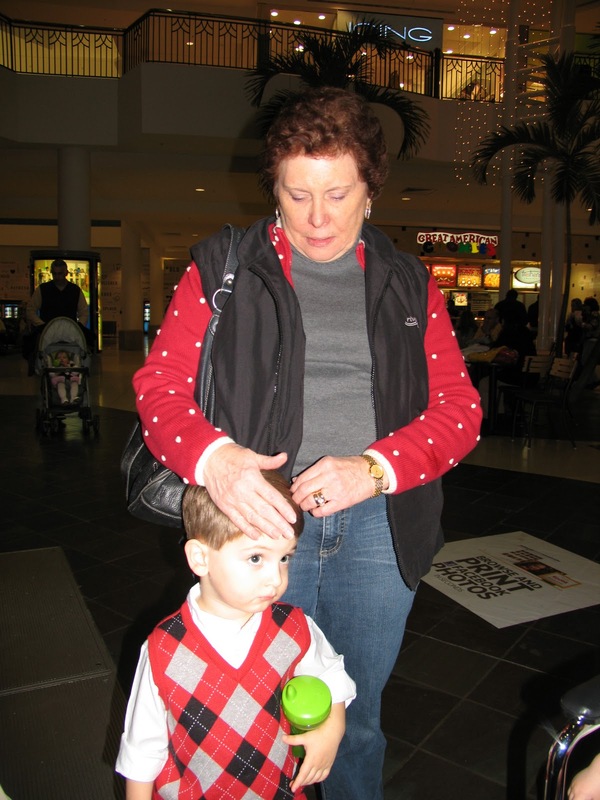 Poor Martin's Almanac: Operation Mall Santa: SUCCESS! "Christmas time is here / Happiness and cheer," indeed. 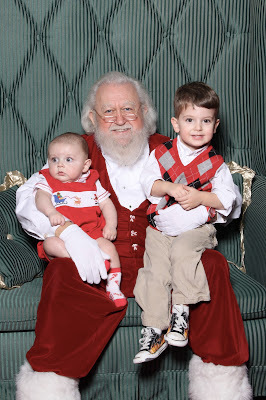 After last year's less than successful trip to the evil man in red, and the previous year's santatastic fiasco, we lacked that special confidence other parents seem to enjoy on taking their children to see their local mall Santa Claus. We'd done a few flybys at Northpoint so Jack could see Santa—to which he often reminded us that Santa was not, in fact scary. But ever those pictures of Jack, arms wide, lungs wider, were front of mind. And ever the fear of a trashing, kicking repeat danced in our heads like pissed-off sugar plums. So it was with cautious optimism that Ann secured us the first place in line for when Santa came back from his dinner break. And with JJ and Meme's help, the boys remained in good spirits throughout their wait. And—behold!—a Christmas miracle was witnessed under the rudy glow of the Great American Cookie Company's neon marquee: Santa descended the escalator smiling and waving at Jack who stood, mouth agape, at the bottom. 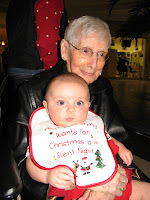 And with their great-grandmother in tow (and threatened to also be seated on ole Kingle's lap) the boys skipped to the head of the line, got a little extra time with the jolly old elf, and—wait for it—no one cried, screamed, thrashed, or even drooled (the worst...shudders). Jack: (blank stare) I don't know. Santa: How about ... some toys?